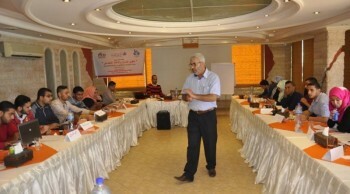 Al-Hadaf Center for Human Rights conducts a workshop at the Press House on " Youth Political Engagement "
The Work shop was attended by a groups of youth with the presence of the director of Al-Hadaf Center, Mr. Yousef Safi, who Said that “Enhancing the engagement of youth in political life and increasing their representation in the decision-making circles needs to intensify efforts based on the concept of self-change"
The meeting entitled "Voices for Change" was conducted after a study has implemented by the Al-Hadaf Center which showed the weak representation of youth in decision-making circles and in the political parties. 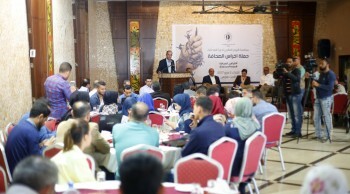 Safi clarified that this weakness is due mainly to youth socialization , as well as their relationship with political parties, decision-makers, and the political circumstances that beset Palestine. 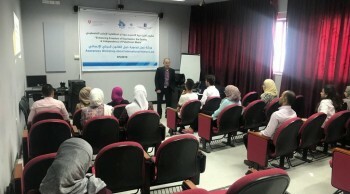 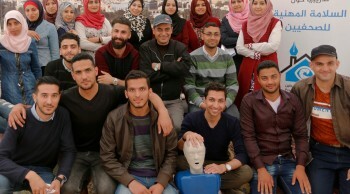 He also stressed the need for all concerned parties to commit a national effort by preparing a national strategy that would provide suitable conditions for the participation of youth in political life and allow them to be integrated into decision-making circles, which support national sentiment, reinforcement and respect for Human Rights and Palestinian Democracy.